Audacity is a great little software program that primarily operates as an editing program. 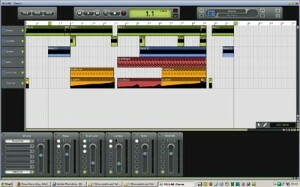 But delve under the hood for a second and you’ll find a multitrack recordig system. Doesn’t support midi but hey it’s free. It looks a lot like a basic version of Cool Edit the pre-Audition mulltitracking software. 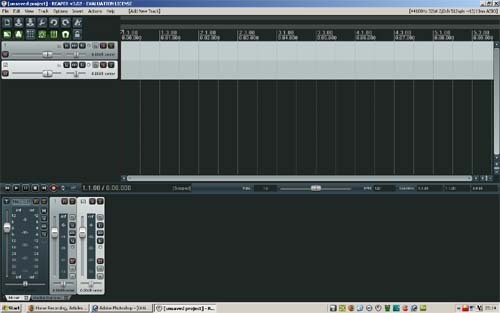 Does take a lot of setting up, ie the vst needs and extra component installing as does VST support and LADSPA plugins. They’re all available from the Audacity site anyway. MU.LAB comes in 2 flavors: MU.LAB Free and MU.LAB Unlimited. MU.LAB Free (which is free to everyone!) has a 6 track limit, can only mixdown in 16 Bit and only supports 1 mono out for ReWired devices. But be sure: a creative soul can do A LOT with that! MU.LAB Unlimited on the other hand can do unlimited tracks, can also mixdown in 32 Bit for more extensive musical productions, and supports all available audio outputs for ReWired devices! The daddy of shareware music creation software, no limits uncrippled and probably the bargain software that pretty much sells itself. It’s in this list because of it’s rare state of treating it’s users and potential customers as adults. You get to try it out in full for an unlimited period, it’s then down to your conscience wether or not to buy it. Brilliant software which is constantly updated and has a very loyal and helpful following who frequent the forums. Lot’s of musicians these days are making the transition over to reaper and for good reason. Great sound card and midi support, VST and VSTi supported also. It’s a breeze to set up and use. Honestly if you’ve used this kind of software before you’ll love it. And as a bonus there is reamote an add on that allows you to connect to a nother laptop via lan to share processing power, your fx and reaper have to installed on the second machine though. Add to that rewire and you can’t go wrong. Try it out and then if you dig it, buy it. It’s only fair.